How to Prevent Phishing Attacks with EV SSL Certificate? Phishing attacks are on the rise. 46,000 new phishing websites are made every day according to Web Root. And anyone can be a target, no matter the size of your business. You need to give your customers something to look for to offer assurance that it's really you they're dealing with online. That assurance comes from EV SSL and the green address bar it activates. There's nothing quite like seeing your company's name appear in the address bar. Sometimes referred to as the green address bar - given the color of the font - this unmistakable visual indicator immediately puts your customers at ease. It builds trust. After all, nobody is going to do business with you if they don't trust you. Don't just add EV SSL and the green address bar to your website, tell people about it. Not only will your customers appreciate that you've made an investment in their safety, but they'll also make sure to look for your name in the address bar before going any further on your website. Here's an example of a great way to educate your customers. Before entering your password or answering Security Challenge, check your browser's address bar. We've added and additional layer of security that shows if you are connected to a safe server. If your browser's address bar is GREEN, your connection is safe. If it's GREEN, stop your log in process and contact us. Here's how the GREEN address bar may appear in your browser. Who's going to phish my company-we're too small? You would be surprised. Hackers tend to target small companies because they tend to have weaker cyber security. There are countless examples of small businesses being imitated by phishers. Most recently, a Canadian university lost $12-million after hackers impersonated 12 Edmonton-area construction companies and sent phony invoices. It can happen anywhere. How will my customers know what to look for? You're going to have to teach them. Unfortunately, the average internet user isn't well-versed in cyber security-they don't know what to pay attention to. But with a little imagination you can easily teach them to glance at the address bar anytime they come to a site purporting to be yours. Is there any other way to get the green address bar? No. 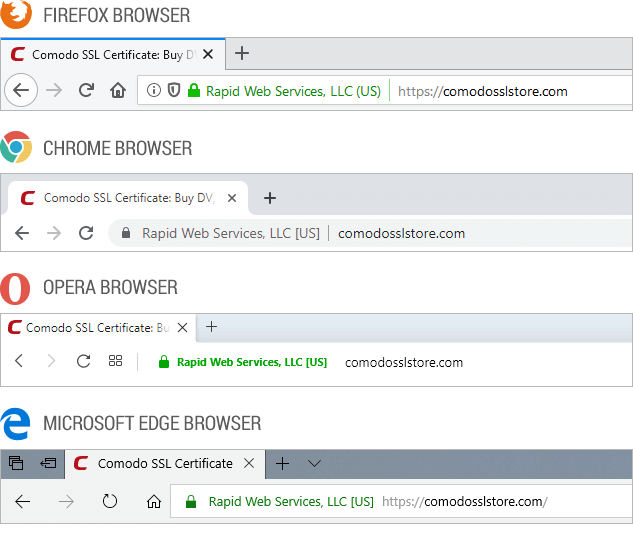 The green address bar is exclusive to EV SSL. It can't be faked or duplicated. You have to undergo Extended Validation to get your name in the address bar.